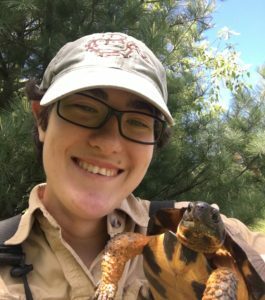 Reine Sovey (2017) and Elizabeth Cubberley (2018) are working as a team on the project entitled, “Distribution and Ecology of Blanding’s Turtles (Emydoidea blandingii) and Wood Turtles (Glyptemys insculpta) in Michigan.” They are using radio telemetry and GIS modelling techniques to investigate habitat use and movements. Their research will contribute to current knowledge of both species and directly impact the development of local management strategies. 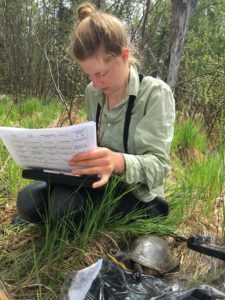 Liz collects some habitat data while a Blanding’s Turtle patiently waits. Reine’s research is focused on habitat use at the landscape and microhabitat levels. Elizabeth aims to identify critical habitat accessibility and anthropogenic barriers to movement. Patrick Ransbottom joined the lab in 2017 and is studying amphibian recolonization of a restored wetland system. He is using holistic wetland characteristics such as age and adjacent plant communities to investigate which factors are linked to successful amphibian recolonization, and hopes to identify key characteristics of wetlands that host thriving amphibian populations, in order to inform future restoration efforts. 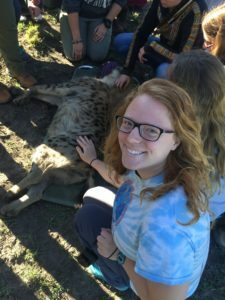 Katelyn and a safely tranquilized hyena. Katelyn Gutwein joined the lab in 2018, and is interested in modeling using historical GIS data. She hopes to be able to expand current models in order to better understand habitat distribution of Massasauga rattlesnakes. Dan Earl also joined us in 2019. He graduated from Central Michigan University in 2015 and spent some time after that working for the Michigan DNR and then with Michigan Natural Features Inventory as a member of Huron Pines AmeriCorps. 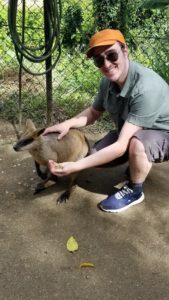 His general interests are in the conservation of rare species, especially rare herps, and particularly species for which we lack observation and distribution data. Jessica Hinson. 2018. Distribution of Populations and Suitable Habitat for Spotted Turtles (Clemmys guttata) and Blanding’s Turtles (Emydoidea blandingii) in Indiana. Alysa Hopkins. 2018. Habitat Selection by Small Mammals in a Restored Wetland System. Monica Matthews 2018. Landscape Ecology of the Eastern Massasauga (Sistrurus catenatus). Jillian Josimovich. 2018. Soft-Release May Not Enhance Translocations of Wild-Caught Eastern Massasaugas (Sistrurus catenatus). Taylor Lehman. 2016. Status of Massasauga Populations and Available Habitat in Indiana. Michael Ravesi. 2016. Timber Harvest and Prescribed Fire as Tools for Massasauga Conservation. Ryan Smith. 2016. Effect of the Urban Matrix on Avian Assemblages in Forest Fragments. Savanna Vaughn. 2015. Short-term Response of Deer Mice (Peromyscus maniculatus) and White-footed Mice (Peromyscus leucopus) to Invasive Shrub Control. Emily Stulik. 2015. Amphibian Occupancy and Habitat Use in a System of Restored Wetlands. Sasha Tetzlaff. 2015. To Forage, Mate or Thermoregulate? Influence of Food Supplementation on Behavior of the Rattlesnake Sistrurus catenatus. Kevin McLane. 2015. Ecology of the Snapping Turtle (Chelydra serpentina) in a Suburban River. Kevin is now working as a wetland ecologist at Green 3 LLC. Adam Bauer. 2013. Landscape Level Predictors of a Suite of Imperiled Wetland Associated Herpetofauna. Adam is a doctoral student at Northern Illinois University. Bryan Eads. 2013. Behavioral Responses of Two syntopic Snakes (Genus Thamnophis) to Roads and Culverts. Christopher Woodley. 2013. Predicting Spring Emergence in a Northern Population of the Eastern Box Turtle (Terrapene c. carolina). Evin Carter. 2012. Impacts of Invasive Plants on Resource Selection and Thermoregulation by the Northern Copperhead. (Agkistrodon contortrix mokasen). Michael R. Frank. 2011. 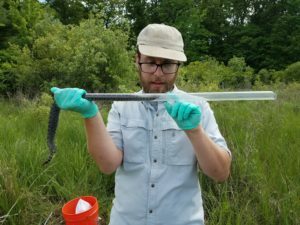 Head-starting as a Tool for the Reintroduction of Extirpated Watersnake Populations. Chad S. Smith. 2009. Hibernation of the Eastern Massasauga Rattlesnake (Sistrurus catenatus catenatus) in Northern Michigan. Joanna Gibson. 2009. Influence of Prescribed Fire on a Midwestern Population of the Eastern Box Turtle. John C. Marshall, Jr. 2008. Population Genetics and Landscape Modeling in Water Snakes. PhD Dissertation, Purdue University. Co-advisor: Rick Howard. Nikolas D. Bieser. 2008. Spatial Ecology and Survival of Resident Juvenile and Headstarted Eastern Massasauga (Sistrurus catenatus catenatus) in Northern Michigan. Brett A. DeGregorio. 2008. Response of the Eastern Massasauga (Sistrurus c. catenatus) to Clear-Cutting. Brian J. Putman. 2008. Habitat Use and Spatial Ecology of the Eastern Fox Snake (Pantherophis gloydi) in a Disturbed Landscape.